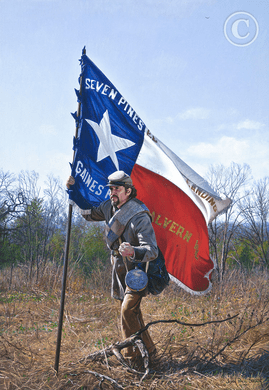 John Paul Strain Hand Signed and Numbered Limited Edition Giclee:"The Texas Battle Flag"
Size: 19 1/2" x 28 1/4" - Additional sizes and mediums will be listed for selection from the Drop down box. Medium:Giclee on Paper and Canvas - Select available options from drop down box. About the Art: The battle flag the 1st Texas Regiment carried into the most ferocious and desperate two hours of the battle of Antietam proudly flew the colors of the State of Texas. No thank you, I just want the 19x28 unframed print.